The World Innovation Awards are run annually by UK-based publisher, FoodBev Media. Freedom Food’s Barley+ Seven Seeds Bar made the finals list in the Best Snack category. The Barley+ range was launched in July 2017 and includes muesli, muesli bars and wraps using the CSIRO developed BARLEYmax grain. BARLEYmax grains contain three types of fibre and was developed with the intention of boosting the nutritional content of snacks like muesli bars. Freedom Food’s Messy Monkeys whole grain snack bites made the finalist list in the children’s nutrition range. The Messy Monkeys range was also only launched in July 2017. 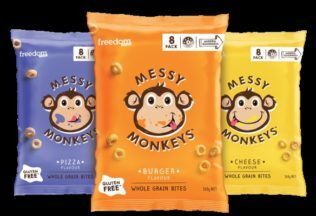 Finding success with the initial launch, Freedom Foods now says it plans to launch more Messy Monkeys products in the coming months.